The collection includes 6 products available for purchase. There are 2 separate lip kits (lip gloss + lip liner), a tinted plumping lip gloss, an eyeshadow palette with 12 shades, a highlighter, and a sugar cookie flavored lickable body shimmer. Here’s a video from Too Faced on how to apply the Polite and DSL Lip Kits. Line (or overline if you wish) the outline of your lips with the lip liner. Make an “x” at your cupids bow to give it more definition. Color in the lips with the lip liner. Add the lip gloss on top. You can also wear each product separately or mix and match. To make your lips appear larger, outline with a darker shade then apply a lighter lip liner and/or lip gloss to the center of the lips. You can also top any of the combinations with the Painkillr Pink Lip Injection Extreme to plump the lips. The Too Faced Lip Injection was an iconic product and this is the first ever tinted version. You can apply it over lip line, lipstick, or alone on bare lips and it blossoms into a pretty hot pink shade. The Erika Jayne x Too Faced Pretty Mess Eyeshadow Palette contains 6 matte eyeshadows and 6 shimmers. The shades are named after various “Erika-isms” from Real Housewives. This powder highlighter is supposed to be soft and ultra-creamy to the touch. It provides intense one-swipe shimmer and gives a shine so bright that skin looks wet. This one was named after on of Erika Jayne’s hit songs of the same name. This is a sugar cookie flavored likable body shimmer. It comes with a puff to apply the rose gold champagne pigment onto the décolletage, shoulders, legs, arms, etc. Erika Jayne says it makes your body look airbrushed. Erika Jayne aka Erika Girardi is both a pop star and a star of The Real Housewives of Beverly Hills. 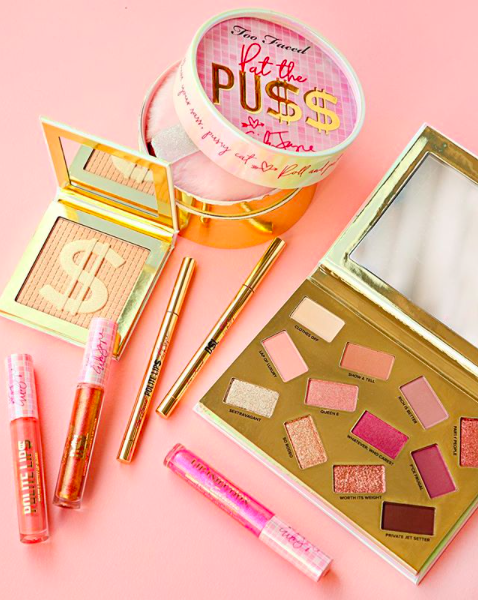 Her new makeup collection with Too Faced gives a nod to both of these roles in the names of the products and colors and because they can give you both a more subdued/natural/Real Housewife makeup look or a glam/pop star/Erika Jayne stage makeup look. The collection is available starting Tuesday February 12, 2019 online at TooFaced.com . This is the same day as the premier of Real Housewives of Beverly Hills. It launches at Sephora and Sephora.com on Monday February 18, 2019. People reported Sunday February 17th, but Erika Jayne said on IG it will be the 18th. There has been some controversy over this new Erika Jayne makeup line especially over the names of the products. I read comments where people were saying they didn’t want their kids reading the names of the products. Some people think it’s too vulgar. In response, Too Faced put “Warning” labels over the products to protect them from the horrors of the already censored “How Many F*cks Do I Give?” “Pat the Pu$$” “Clothes Off” “F*ck Frugal” “DSL” “Sextravagant” “Painkillr” etc etc. names. In my opinion these are people that probably wouldn’t be buying the products anyway and they just feel like complaining. It takes 3 seconds to apply highlight and body shimmer and then toss them back in the drawer or your makeup bag and out of sight. I also saw people complaining about how Erika Jayne spends $40,000 a month on hair, makeup and clothes. First of all, this is her job. Makeup, a glam squad, and clothes are to Erika Jayne as computers, printer ink, and pens are to people with ‘typical’ jobs. No one asks why you spend $49 on toner instead of donating it to hungry children Janet. Second, how much do you think other celebrities spend on this stuff? And third, of course this has to do with gender because no one goes on a male singer’s Instagram and asks why they’re wearing Tom Ford suits when they could be using that money to help people experiencing homelessness. Erika Jayne’s 2018 memoir Pretty Mess is now available in paperback ($16). I haven’t read it yet, but might need to get it just to display on my coffee table (and read, duh). What do you think? Will you be buying anything from the collection? Is it too vulgar? Do kids actually read the names of eyeshadow colors in palettes or on the bottom of a lip gloss! ?